How to Live Longer and Financially Plan for It | How Does Life Insurance Benefit You? Life insurance for children… sounds a little creepy, but it can actually be an extremely beneficial way to plan ahead for your children’s future. Adding a child rider onto your term life insurance policy is the easiest way for you to purchase life insurance for your child. How it generally works is that you pay a few extra dollars on top of your life insurance policy’s monthly premium and then each of your current children under the age of 18 and any future children you may have are covered with a small amount (typically anywhere between $1,000 – $100,000) of life insurance coverage. Losing a child would be unimaginable and the funds a child rider provides could be used to pay for a funeral and allow the parents to take time off work to grieve. While this death benefit is one aspect of what a child rider can offer, another benefit is that purchasing a child rider guarantees your children’s future insurability. What this means is that once your child is of age (typically 18-25) you can convert the child rider into a permanent life insurance plan and your child would not be required to prove, via medical exams and records, their insurability. If your child happened to develop a medical condition that could otherwise prove difficult to insure this guaranteed insurability would be a lifesaver. Most life insurers require parents to complete a questionnaire form providing information on their children before they would approve the child rider coverage. 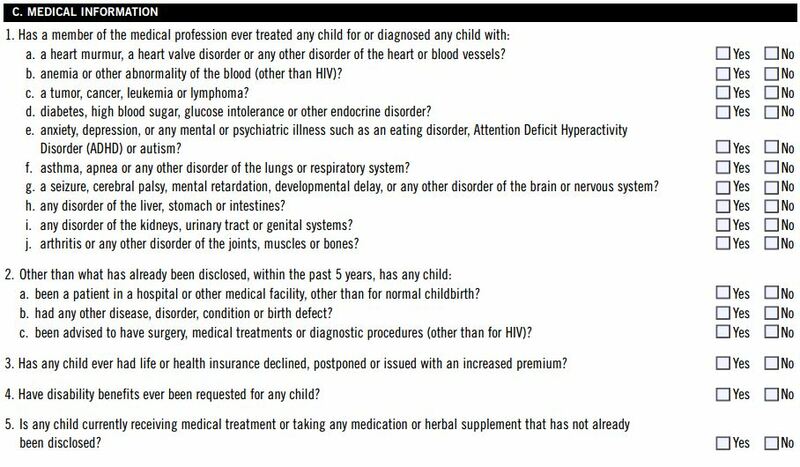 Depending on the insurer, some forms are simple with a few questions and some are much more inquisitive. 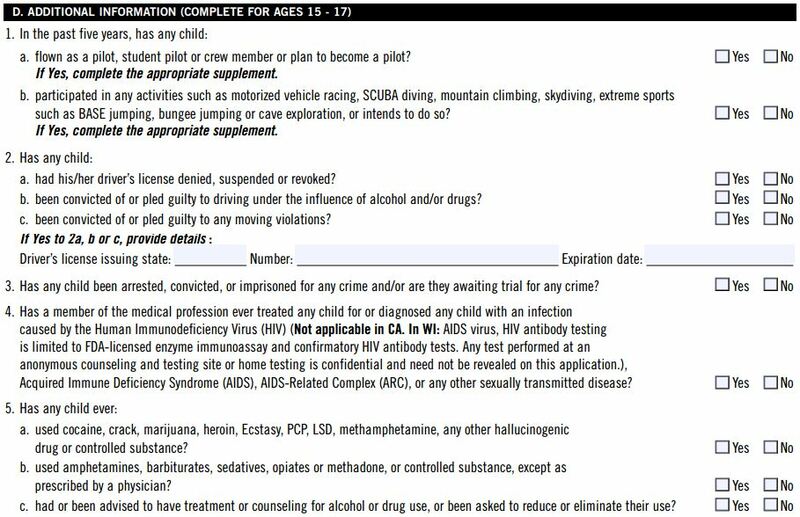 Below are a few screenshots of one company’s child questionnaire form. That form would be an example of an insurer who requires more in-depth information on children before approving child rider coverage. If any children have been, for example, diagnosed with any chronic illnesses they may be denied coverage. So, what can a parent do? Are there child riders that do not require medical underwriting? Principal Financial is one life insurance company in particular that does not require any medical or lifestyle information on a child for rider approval. They offer a maximum coverage of $25,000 and allow you to convert the rider to a permanent life insurance plan up to three times the amount of the rider in accordance with the conversion deadline in their contact. For parents with children who have special needs or have been diagnosed with a serious medical condition, this child rider can be extremely beneficial. In a previous blog post titled Everything You Want to Know About Life Insurance Child Riders we wrote an overview on child riders. In this post we touched on an example in which Principal’s child rider would be especially advantageous. Let’s dig a little deeper into that situation. Jane Doe is 40-years-old and she is planning on purchasing a $500,000 20-year term life insurance policy from Principal. She wants to add a child rider onto her policy as well. Jane does not smoke and is quite healthy. She qualifies for the Preferred risk class. Jane has four children – a 22-year-old daughter, twin 15-year-old sons, and a seven-year-old daughter. Jane’s eldest is older than 18 so she would not be covered by the child rider; however, her twins and her seven-year-old daughter who has been diagnosed with acute lymphoblastic leukemia fortunately will be covered by Principal since they do not require medical underwriting for child riders. Today, most childhood leukemias thankfully have very high remission rates. If the worst should happen though and her daughter passed away, Jane would receive $25,000 which would allow her to pay for a funeral and take the needed time off work to grieve and spend with her other children. The child rider benefit of guaranteed future insurability is also particularly advantageous for Jane’s seven-year-old daughter. Applicants with a history of acute lymphoblastic leukemia would typically only be able to qualify for Table B ratings, and this would only be available nine years post-treatment (on average). Table B means the applicants would have to pay 50% more than Standard premiums (see table below for reference). However, Jane’s daughter would be able to convert to a $75,000 permanent policy at Standard regardless of the status of her leukemia. As beneficial as a child rider would be for Jane and her children, the Principal child rider would be even more beneficial to a parent who has a child with special needs, such as Down’s syndrome. Unlike leukemia which can go into remission, Down’s syndrome is a lifelong condition with considerably reduced life expectancy. You would be hard-pressed to find a carrier to approve an applicant with Down’s syndrome. Some insurers will approve coverage if the condition is mild, but the applicant would be highly rated (Tables H-J likely used) ergo the premiums would be very expensive. With Principal, however, a special needs child would be covered by the child rider and could later be converted into a permanent policy.